Please welcome author Matthew FitzSimmons to the blog today. 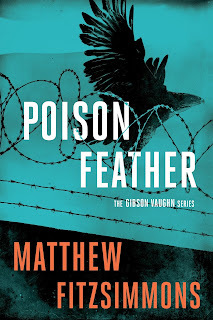 His new book is titled Poisonfeather, second in the Gibson Vaughn Series of thrillers. Published by the Amazon imprint, Thomas & Mercer, this book follows the release last December of The Short Drop. In 1966, Tom Stoppard’s Rosencrantz and Guildenstern are Dead premiered at the Edenborough Festival Fringe. Famously, it took two minor characters from Shakespeare’s Hamlet and reenacted the play from their limited perspective. The events of Hamlet become nonsensical, and a perplexed Rosencrantz and Guildenstern struggle to comprehend what is happening around them, suspect that life is rigged against them, and grow to fear that they are nothing but pawns in Hamlet’s story. Worst of all, they aren’t sure which of them is supposed to be Rosencrantz, and which is Guildenstern. Neither are the other characters in the play who consistently mix them up. And why wouldn’t they? Their creator (author) has imbued them with no distinguishing characteristics or history. They are, for all intents and purposes, interchangeable. I imagine we’ve all had that experience as readers. Halfway through a novel, we come across a previously established character – let’s call him John – but can’t distinguish him or remember why we’re supposed to care. Sometimes, we will flip back to remind ourselves, but other times, we will muddle on because we don’t care enough to find out why we should care. Anyway, John is only a minor character whose sole purpose is to advance the plot and/or help us learn more about the protagonist. We don’t care because John isn’t a character at all; he’s a device. He is a Rosencrantz, or is he a Guildenstern? It’s so hard to tell them apart. Everyone is the protagonist. In life, everyone is their own protagonist. Everyone lives at the center of the story because that is what it is to be human. Kanye West is an enormously famous and successful musician, but his personal assistant still experiences life as the protagonist of their own story. To underline the obvious, people are at the center of their own worlds regardless of who or what is around them. That’s what makes walking a mile in someone else’s shoes so difficult – we almost never take off our own. This isn’t exactly an earthshattering insight, but it’s useful to think about when writing fiction. Inherently, narrative storytelling is about privileging certain perspectives over others, narrowing the reader’s focus to a handful of characters. I do it. I don’t know of an author who doesn’t. Not every character gets to be the protagonist of a novel, but every character should think they are. And it’s imperative that every character act as if they are. Trouble starts when, having decided which characters are at the center of the story and which lie at its periphery, a writer treats the supporting cast with contempt. There is nothing worse than a supporting character who knows they are one. Such characters lack conviction and are easy to spot. They act not in their own best interests but instead make choices that abet lazy plotting. We feel it in our bones when a character does something that no rational person would do. Watching a scary movie, it’s that moment when we shout at the screen, “Don’t go in that dark room alone, you idiot!” That’s not a character who wants to survive but a character forced to entertain you. You can’t remember that character’s name either, can you? So how to avoid it? How do we distinguish our supporting casts? How do we make “John” matter when supporting characters are inherently at such a disadvantage – they get less time on the page and are, let’s be honest, supporting characters. There are cosmetic approaches – idiosyncratic names, appearance, speech, or behavioral tics. But unique characteristics do not actually make a unique character. Not on their own. Not unless we feel that character has a perspective and an agenda independent from the story. Not unless they believe they are the protagonist of their own story. I have a background in theater and at one time wanted a career as a director. It was not to be, but that skillset has proven invaluable as an author. Like novels, plays have their protagonists and their supporting casts – Hamlet being a case in point. Unlike novels, the characters in plays are portrayed by flesh and blood actors. Actors craft a performance, and the good ones don’t craft smaller performances for smaller parts. It’s no accident that Phillip Seymour Hoffmann spent his career stealing movies in supporting roles. Good actors advocate for their characters regardless of the part. I saw part of my job as a director as entering into a dialogue with the actors, interrogating them, helping them fully realize their character while also fitting them into the larger narrative of the play. I still see that as my job now as an author. Which means, yes, I spend time talking to fictional characters that exist only in my head. Not exactly a poster boy for mental health, but then again I’m a writer. Sometimes these conversations are inconvenient as hell. In order to advance the plot, I might need a supporting character to make a particular decision. But it’s not enough though to decide that a character does something, it’s critical to know why. Sometimes the characters aren’t cooperative, point out some aspect of their character that contradicts the decision I need them to make, and I don’t get what I want. At that point, I have two choices – rewire the character to fit my needs or go back to the drawing board. I strive to always choose the latter. It makes my job harder, but I believe the end result is worth it. Less predictable. We’re all the protagonists of our own stories. If you hope to write a story that feels as real then every character, no matter how seemingly insignificant, deserves to think so, too. So listen to them even if sometimes they drive you crazy. Born in Illinois and grew up in London, he now lives in Washington, DC, where he taught English literature and theater at a private high school for more than a decade. 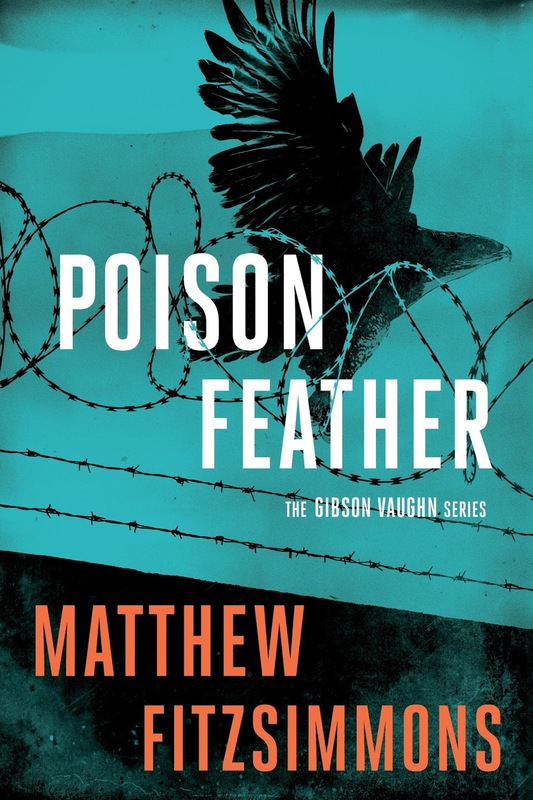 Poisonfeather is his second novel. I've always enjoyed the way writers like John Gardner could deconstruct a classic like BEOWULF and create a work like GRENDEL, the story told from the monster's point of view rather than the hero. Grendel became the protagonist. A creative spin. We all learn from reading such work. I think it's important to give those walk-on characters attention enough to make them equally as 'real' as the major characters. I also think all writers can learn a lot from theater. I've had minor parts in horror movies. One of the parts was that of a securty guard. I remember thinking that this guy has a job, perhaps a wife, a mortgage...a life beyond the few seconds he's given on screen. I'm not much of an actor, but I did have an epiphany of sorts. My minor characters in my writing also have lives beyond the few seconds I give them in my story or novel. I began listening to them, and I truly believe my stories have become stronger for that. Your post was a reinforcement of that. Thank you.